This is a followup to the Google Pages incident. Justin, the project manager, said he’d send a goodie bag, and so he sent me a goodie bag! It arrived yesterday. 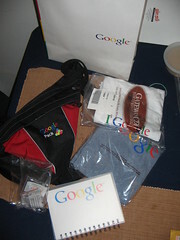 There’s three Google T-shirts, a “Google Pack” (that is, a small bag with “pack.google.com” on the strap), a Google notebook, and a bunch of little magnetic flashing body lights with the Google logo on them. Thanks, Google! Now hire me! 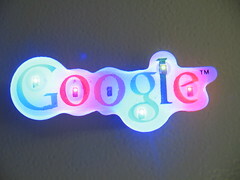 Google kitsch! Well… it’s the thought that counts. I want a Google tee!!!! WAH! I like the notebook, myself. Those plastic-covered, spiral-bound ones are what I use for journaling and sermon/lecture notetaking. Just thought I’d mention that in case you didn’t want it. Then everyone would ask me about it, and I could tell them about my brilliant friend who fixed Google!